Y’all. Last week I broke protocol and wrote about men in sports on the blog. I feel/felt so strongly about the treatment of black bodies in this country that I just couldn’t remain silent about the most recent incidents of police officers senselessly taking more of those bodies from the face of the earth. After I got that out of my system, I said “CeCe, chill on the politics, race and sports stuff. Let’s keep it simple, for a while at least.” Y’all I tried. I really did. I introduced a new lighthearted series and even have an awesome Olympic Flashback for you tomorrow. But Lisa Borders and the WNBA just don’t want me to be great. They don’t want me to keep things simple. They just don’t. 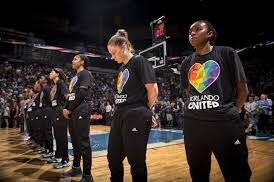 Yesterday the League levied fines against the New York Liberty, Phoenix Mercury and Indiana Fever and their players for wearing black warm up shirts in the wake of recent shootings by and against police officers. For supporting the Black Lives Matter movement AND the Dallas police officers who were gunned down during protests, all three teams were fined $5,000 and each player was fined $500. The basis for the fines, according to league officials, was that the shirts violated league uniform rules. Now on its face, that rationale seems unbiased and straightforward. You know, it sounds like the league is saying, we support your desire to be an activist, but we just want you to maintain protocol. But I promise you that’s not what this is really about. It’s absolutely about race and politics and sports and the WNBA picking and choosing which causes it would like its athletes to support. And if I were the women being fined, I’d want my Players’ Association to appeal Border’s decision. I’m not a player though and I’m not employed by the Players’ Association, but what I can tell you is how I would argue against the fines if I were either. So I’m going to use another addition of GladiatHer Law to make my hypothetical arguments to Lisa Borders and the WNBA. In my opinion, there isn’t one. The agreement that the League signed with its players, the CBA quoted above, requires the players to wear team OR league issued clothing. I think there’s a great argument that the Liberty, Mercury and Fever supplied (or at the very least endorsed) the players’ t-shirts. All of the players wore the shirts after group discussions and planning. The shirts weren’t the result of the efforts of a few, but of a collective; approved by the coaches and front offices. And, at least in the instance of the Liberty, the shirts were same color and manufactured by the same brand (Adidas) as the team’s normal attire. The players violated no league standards in wearing their shirts. Word on the WNBA streets is that prior to the fines being issued, the league sent out updated/reminder uniform policy and that the policy limited players to wearing only WNBA supplied, not team-supplied, attire. Com’n son. The League knows sports law better than that. See the way CBAs are set up, you can’t just change the rules mid-season or mid-contract. The players can only be held to the standards they originally agreed to. And that standard includes the option of wearing team issued uniforms. So bogus rules re-write aside, we’re back to the fact that the teams likely provided the shirts that resulted in the fines; therefore, there should be no violation. Beyond the black and white law that neither the teams nor the athletes seem to have violated are the issues of precedence and justice. After the tragic mass murder that occurred at Plush night club in Orlando, FL, the league designed and sent to teams special-made t-shirts for players to wear in support of the city’s victims and a call for an end to gun violence. With that move (and other instances of LGBTQ support initiatives) the league has effectively set a precedent for the use of the WNBA’s voice to promote non-athletic, minority issues that impact a great number of women who make up the WNBA. Fining the teams and women for continuing in that spirit, in support of African-American issues, is not only a departure from the league’s own precedent but also an unjust act of requiring group support for one controversial issue and not allowing it for another. Adding insult to injury is the well known intersection of race (in a predominately African-American league) and sexual orientation. For the women who are African-American AND members of the LBGTQ community, the league is effectively asking them to ignore one part of their identity while throwing support behind another. In addition to the law, precedence and justice, equity is not on the side of fining the teams and women for non-violent activism. 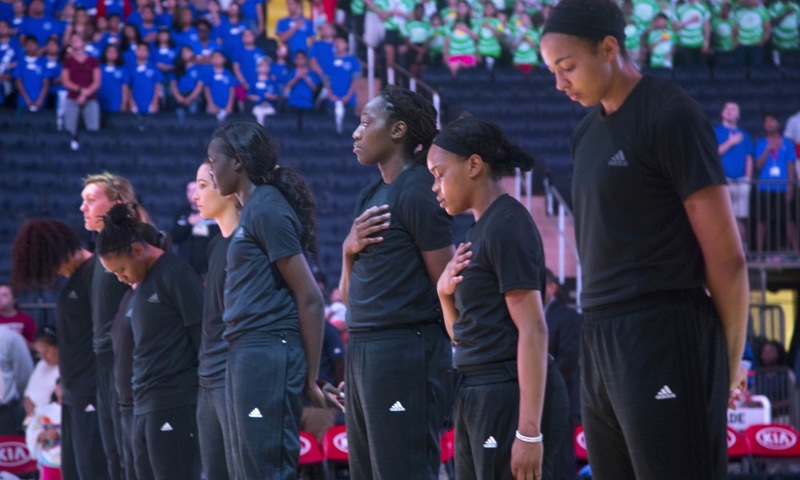 The first team in the WNBA to show united support for the Black Lives Matter movement and the for the families of the police officers slain in Dallas was the Minnesota Lynx. Team members wore shirts that bore the names of Alton Sterling and Philando Castile, the Black Lives Matter hashtag and a picture of the Dallas Police Department’s emblem. The ladies even gave a press conference in the shirts. Despite the blatant display of activism, neither the team nor the players were fined. #HowSway? If the rationale for the fine is that the teams and players broke uniform policy, how are the Lynx and its players not also subject to the same fines? In a league that would like to pride itself on fairness, such an inequitable outcome can’t be allowed to stand. That’s not to say that the WNBA should now fine the Lynx and its players, but that it should treat the Liberty, Mercury and Fever the same way it treated the Lynx; let them voice their concerns without monetary repercussions. In a league that has been on the losing end of finding consistent support, it really is a shame that the choice was made to penalize these teams and their players. Rather than using the current national climate as an opportunity to let the league be a beacon of equality, acceptance, hope and unity, and to garner support on those grounds; it chose to present itself as a biased organization. Its double standards cast a shadow on a league that’s already trying to climb out of the shadows of other sports. It’s doubly shameful that a league that already pays its women far too little for the hard work they put in, would decide that its best course of action to silence those women would be to take back what little money they are paying them. It’s the epitome of kicking a woman while she’s down. If there’s one ray of sunshine beaming through this disaster of a decision it’s that the women of the WNBA do not seem to be deterred. Players from each team have voiced their commitment to continuing to speak loudly about police brutality and racial injustice. They have even staged a media blackout where they refuse to speak about anything except their activism. It’s wonderful to see that despite the WNBA’s continued inability to find a stable voice, its players do not suffer from the same insufficiency. There is hope for activism in sports and it’s wonderful that women are leading the way. So yeah, that’s what I’d tell Borders if I were a player or WNBPA rep. And I’m glad she got me out of chill mode…it really is kind of boring there.